Recently my husband and I attended a family wedding. 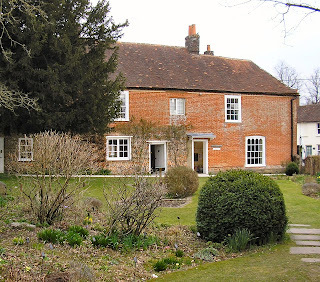 We drove from Yorkshire and stayed in a cottage in the village of Chawton in Hampshire, almost next door to the house where Jane Austen lived. 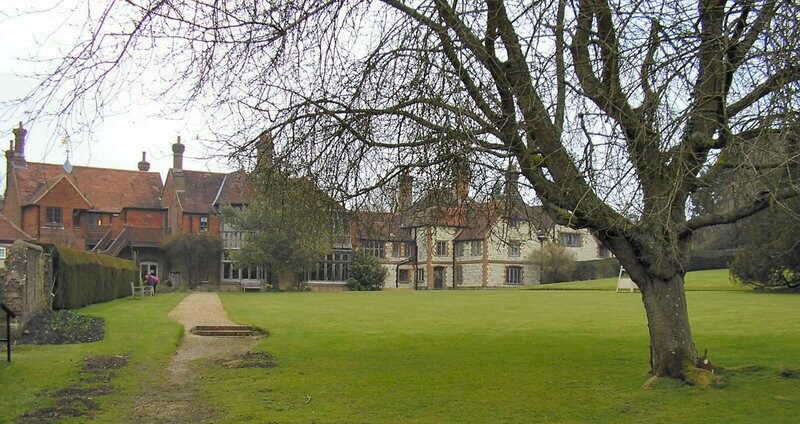 Chawton is a delightful country village, close to the market town of Alton. The manor house where Jane Austen's brother Edward sometimes lived lies a short walk away and Jane knew it well. Her sister and mother are buried close by, in the grounds of St Nicholas' Church, and you can see their well-tended graves. The cottage where Jane lived with her sister Cassandra and her mother and where she revised Sense and Sensibility and Pride and Prejudice and wrote Mansfield Part, Emma and Persuasion, is airy and spacious with beautiful gardens. Inside you can see the tiny table on which Jane wrote her novels. Chawton itself was within walking or donkey-cart distance of Alton and a surprisingly bustling place in Jane's time since the main coach road ran through the village. 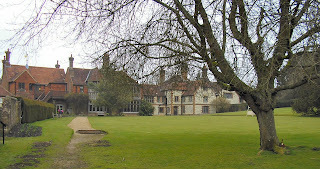 Four miles from Chawton in Selborne, the house of the naturalist Gilbert White is larger, with extensive gardens. You can see his study and writing desk. I would have liked to have walked up the Hanger on the path Gilbert White made but sadly could not - I had a chest infection and was too ill. But an interesting visit, nonetheless. Lovely post, Lindsay. I've been past Alton but never had the time to pause and enjoy. I must rectify that! Lindsay--I was curious about the Alton buckle..thanks for the photo. The house is like the one in the film, Pride and Prejudice. I've seen that style house in other photos, etc. It must have been the standard, such as a Ranch Style House in the 80s in the US. Common style, in other words. This was very interesting, and of course, so far from my experience..lovely. Very interesting, Lindsay. That Alton buckle is magnificent. And people still dismiss the period as The Dark Ages - as in... from which the Normans dragged us into the light. Yeah, right. Don't get me started! I truly enjoyed reading about these historical places in England and the pictures were fascinating. I so want to visit Chawton, Lindsay! And what a magnificent buckle. Thanks so much, Sarah, Rosemary, Celia, Linda, Lily! I wish I could have visited more spots - there was Petworth House (stately home) and Petersfield (ancient town)and more, but hubby and I just weren't up to it. But yes, the places we could get to were special.